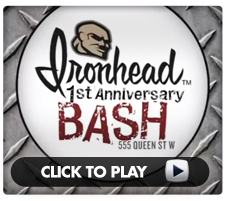 Ironhead Clothing's 1st anniversary party for their 555 Queen Street West store. Ironhead clothing, located in Vancouver, BC, Canada is a very popular clothing store that sells a line of hoodies, T-shirts, and accessories for men, women, and children. The store is a major success with young and old alike. Video production and marketing play are major contributors as to how successful a company or brand will be. The video for Ironhead is one that is well-produced. The music is fun and appropriate for this particular business, the layout of the store as well as the items sold there are showcased in a manner that makes a consumer who is looking for this type of clothing want to shop at Ironhead. A really important factor, though, is that even if a person did not know about this store, the video production is of such high-grade and quality that it could entice a consumer who is just becoming aware of Ironhead to want to make purchases there. Smart business owners, manufacturers, and professionals are well-aware from early on about the importance of connecting with highly-rated video production, web design, and marketing agents. Without these key players involved, a business could find itself on unsteady ground that may or may not stabilize in the future. With Ad Army Group, the future of your company can be even brighter than what you imagined. Ad Army Group is the number one video production, web design, and marketing consultant agency in Toronto. It is, in fact, the company that did the video production for Ironhead. Ad Army Group is the video production Toronto industries and businesses have come to rely on time and time again for all of their marketing needs. This agency offers its clients all of the components needed to help that business build its brand and become successful and profitable. Ad Army Group has done video production for Zenon Konopka, Darryl Sittler, Ryan O'Reilly, as well as Remax real estate agents, Toshiba, and soup it UP, to name a few. The videos produced by this company are appropriate to industry, feature sets that are eye-catching, content that keeps the viewer engaged, and actors that are well-versed and knowledgeable as to the subject matter of the video. Ad Army Group is unique in that it has the ability to provide video production, web design, and marketing for its diverse clientele. Businesses no longer have to shop all over town looking for the best video production company, web design company and marketing agency in the singular sense. Ad Army Group is able to provide all of these services under one roof. It really makes good, sound, business sense for a business to have one business that can provide all three services. Anyone who has been in business knows the headaches that can be had when dealing with several different agencies – scheduling, lack of communication, misunderstandings due to lack of communications – the list goes on and on. Ad Army Group is an agency that can ease the headaches and anxiety caused by trying to juggle too many agencies. One of the many advantages that a business stands to gain by employing Ad Army Group is knowing that it has hired a company that is unique in t he sense that it really knows how to market a business so that consumers will flock to it. Other ad agencies simply do not have the same business acumen as Ad Army Group. Because this company knows that each industry is different, it does not offer two separate businesses the same solution. In other words, the marketing that Ad Army Group does for an athlete is not going to be same marketing plan used when marketing a model. Ad Army Group recognizes the important role that videos have in capturing consumers. This agency understands that when a person has a visual as well as audio presentation of a product, that consumer is very likely to seek out that company. The fact is that Ad Army Group has the know-how to get your business on the map in a good way. This know-how is what is going to have a positive effect on your bottom line. While Ad Army Group has a target audience that includes business owners and marketing managers, this video production Toronto agency is widely sought out by professional athletes like Darryl Sittler and Zenon Kanopka, and Ryan O'Reilly, model Monika Schnarre, The Winemaker's Report, and soup it UP. This is a very short list of Ad Army Group's diverse clientele. While this agency is located in Canada, it is available to service businesses in the United States and even as far away as India. Even if your business is not situated in Canada, you absolutely have the opportunity to have Ad Army Group's knowledgeable team on your side to assist you with your video production, web design, and marketing needs. The video production team at Ad Army Group uses state-of-the art technology and equipment to produce videos, TV shows, webmercials, and more. This marketing consulting agency understands the importance of producing quality videos that resonate well. A video that is well-produced will entice new customers to a business. It can also be said that a video that is well-produced will keep your established customers coming back for more. Ad Army Group understands the importance of proper video production and marketing to the extent that it is vital for businesses to attract new customers, but it is equally important to maintain those established customers. A satisfied established customer will very likely point a new customer to a business's website for information. When a website has a high-quality, well-produced video embedded within it, said company's business is likely to skyrocket. Ad Army Group understands the importance of getting the word out about a business as well as effectively telling and showing what that business is all about. This company is able to provide your business with video productions that consist of event and Internet videos, voice-overs, custom music, client story and testimonials, along with many more time-proven and effective marketing strategies. Ad Army Group does not limit its vast and diversified clientele to large corporations or well-known businesses. Ad Army Group works with businesses of all sizes. Even if your company has been in business for a number of years, you stand to greatly improve your bottom line by having Ad Army Group to help you in revamping your brand. This ad agency is well-aware that many businesses have been in existence for many years, before the Internet age, before the popularity of videos. Ad Army Group strives to help established business to update their marketing so that they will stay relevant in the 21st century as well as attract new business. The ongoing success of your company is the main priority of Ad Army Group. The driving force behind the success of Ad Army Group is Paul Cookson. Paul is the marketing consultant/creative director for this dynamic advertising agency. His hands-on approach has certainly put Ad Army Group miles ahead of other marketing agencies. With his 20 plus years of sales, marketing and entrepreneurship, Paul has set the bar really high. His extensive knowledge of the marketing industry and his ongoing ability to remain engaged with the needs of a 21st century company have been the reasons that he has attracted such clients as soup it UP, Toshiba, Remax, Monika Schnarre, Darryl Sittler, and many, many more. Ad Army Group understands the importance and impact that video production can have on any given industry. A video that is recounting a professional athlete's very personal encounter with a health issue would certainly contrast in content with a video that is being produced to promote one's brand. Paul Cookson, along with his team of hard-working professionals, and their knowledge of video production technology will work with you to map out a plan so that your video will be one that not only affects your bottom line in a very positive manner, your video will be one that you as a business owner or someone who is building and maintaining a brand will be proud to showcase. As a business owner, you know that in the fast-paced 21st century, the race to capture new customers and retaining established clients is tight. Savvy owners are aware at the outset the importance of working with a marketing consultant who has desired positive result time after time. Ad Army Group is the premiere video production Toronto agency that you should be calling to help make your business become successful beyond your dreams. Give marketing expert Paul Cookson a call at 416-286-2860.